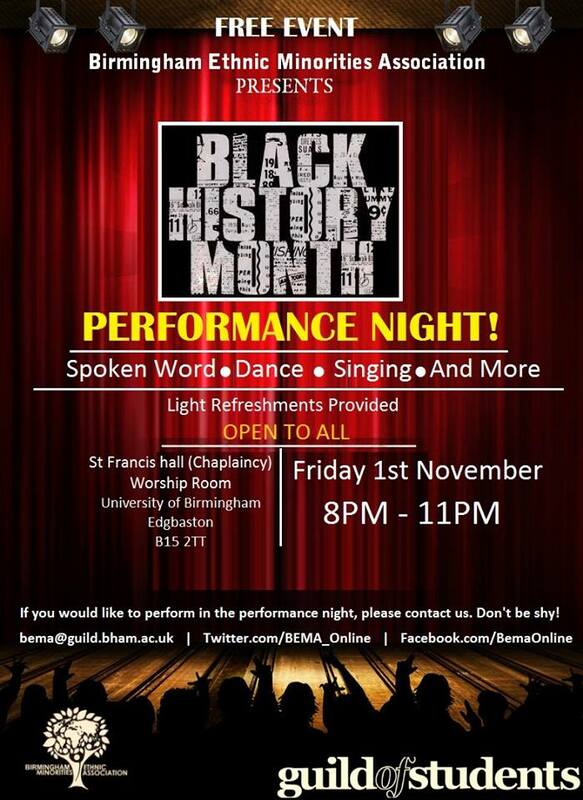 BEMA’s Black History Month 2013 comes to a close with a performance showcase this Friday, 1st November. The free event features spoken word, singing, music and more, with BEMA members from across Birmingham. If you want to get involved in performing there’s still time – please contact us at bema@guild.bham.ac.uk asap. In collaboration with the Women’s Association, LGBTQ Association and DAMSA (Disability and Mental Health Students’ Association) we present a series of talks and discussion looking at the way Racism and other oppressions in society interact and overlap. 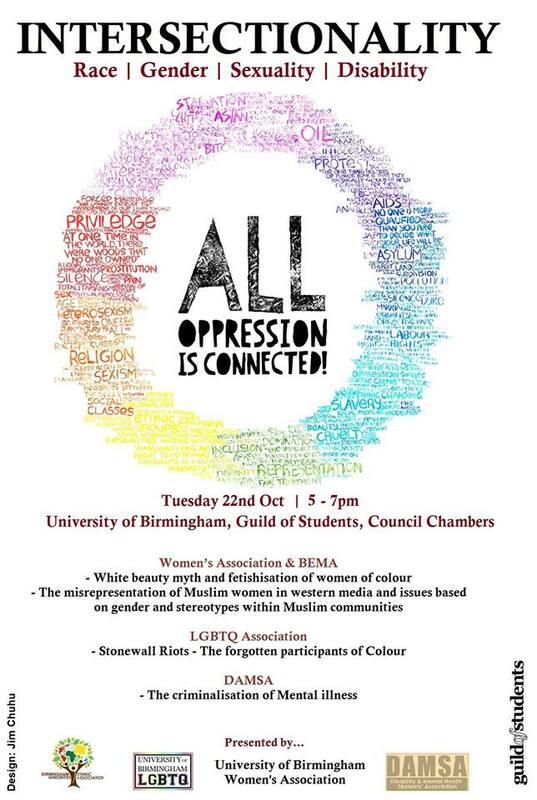 Topics include the White Beauty myth, misrepresentation of Muslim women in Western media, the forgotten BME participants of the Stonewall riots, the Criminalisation of Mental Illness in BME individuals as well sections on Class and Religion. Twenty years after Stephen Lawrence’s murder and the failures that followed in its police investigation, we look at the ways that the British state has(n’t) changed in its treatment of, and response to, BME communities. With a diverse panel of speakers we’ll look at how the Police, Higher Education, Mental Health and Immigration services all operate to keep BME communities repressed in Britain, and the different forms that institutional racism has taken over the years. Will also feature a screening of the short film ‘Absent from the Academy’, highlighting the lack of Black academics in Higher Education, and the experiences of those working in it.There will also be free Caribbean food! BEMA’s Black History Month continues with a talk and Q&A from Jonina and Lorenzo Ervin, two veteran community activists and former Black Panther party members from the US. They will be speaking on the mass incarceration of Black and BME individuals by the racist criminal justice system in North America and abroad, and how to build international solidarity movements in support of the oppressed, drawing from their experiences at Black radical organisers in the USA. This Friday (11th October) BEMA’s Black History Month series of events continues with a film screening and discussion of the documentary ‘The Black Power Mixtape 1967-1975′ (with free food), in collaboration with the NUS Black Students’ Campaign Midlands. The Black Power Mixtape features previously unreleased archive footage interviewing prominent figures from the US Black Power movement through the 60s and 70s, including Angela Davis, Stokely Carmichael and Bobby Seale. BEMA’s Black History Month series of events begins this Thursday the 3rd of October with a launch focusing on Nigeria, which celebrates its independence this week. Includes poetry, music, speakers, film and stalls with traditional clothes for sale. For a full listing of our events see below. All welcome, and all free (excluding the external Hip Hop Shakespeare trip). So bring your people, and we’ll see you there.